The tax rate charged on sales orders depends primarily on the customer location. If you're selling to a customer within the same state as your business, then you charge a tax amount depending on your city, county and state tax rates. Every location across the USA has different rates, so please consult your accountant for full advice. Please also note that US accounting within Brightpearl is accrual based - there is no option to use cash accounting when using Sales Tax in Brightpearl. Brightpearl has a default tax code of "- Not rated", which is used for accounting transactions where tax is not relevant, such as bank transfers. You can't delete this code, but you can change the name if you like. Sales tax is applied per line of a sales order using a tax code. A tax code applies a particular rate that is used to calculate the amount of tax applicable to the individual line. The total tax amount on an order is the sum of the tax on each line. Tax codes are applied automatically but can also be edited and assigned manually. A code is automatically assigned based on the tax code assigned to the customer record, but where they have no code the product setting is used. A product is set as taxable or non taxable; a taxable product will use your company default tax code and a non taxable product will apply a zero rate using code "- Not rated". A complete tax breakdown will be displayed on the customer invoice showing the total tax amount per rate applied. Where customers have no tax code set against their record the product tax setting is applied. If the product is non taxable the customer will not pay tax, however, you may wish to be able to distinguish wholesale sales tax from retail sales tax in your profit and loss report, in which case you can create a new tax code with a zero rate that is applied to wholesale customer records. When you add items to orders, the taxable products will inherit the customer tax code. Non-taxable products will still post into accounts as "- Not rated". EPOS is generally used in a set location so the customer is by definition in the same place as your depot, therefore tax is always charged on taxable items and never on non-taxable items. The tax rate used is the company default tax rate which is set at Settings > Company > Accounting: Tax. A sales tax rate is typically made up from a number of components, such as City, County and State rates. The sum of all these rates is what you pay the IRS. Tax components hold the tax rates (%) and are used for each tax reporting authority (City, County, State). Using a component breakdown allows you to get a full breakdown on your tax reports. If you only ever produce tax figures at the tax code level (.e. all you tax gets paid to one authority who subsequently splits it out for you) you can simply create a component for each overall rate. If you're unsure you should create all the separate components as you will not be able to break down your reports later. Tax codes are the made up from one or more components to create the total rate that will be applied each time the code is used. Different tax codes can share the same component so two different cities in the same state would share the state tax rate, but have their own city rate. It's the tax code which is used throughout Brightpearl - applied to customers and orders. Go to Settings > Localization > Tax codes. Click the Add a new tax code button. Enter the tax code and a name. Select the tax components (rates) applicable to this tax code. The total is displayed. Your code is ready to be used. Go to Settings > Localization > Tax zones. Click the Add tax zone button. Enter a name for the tax zone. 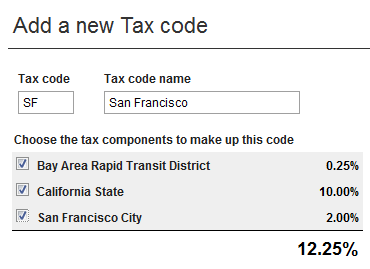 (Optional) Select a tax code applicable to this tax zone. Leave it blank to use the product tax code. Go to Settings > Localization > Tax components . Click the Add a new tax component button. Enter a name for the component, e.g. the city or state name. Enter the rate applicable for this component. Go to Settings > Localization > Countries . Click the Add country button. Enter the country name, ISO codes - 2 and 3 digits and the dialling code. Select the tax zone applicable to this country. Ensure it is set to active. Go to Settings > Company > Accounting: Options . Choose whether to "use today as the tax date when invoicing". Go to Settings > Company > Accounting: Tax . Select your default tax code.